Now that I can get sound out of my Raspberry Pi (RPi), the next logical step for me is speech synthesis ... Right? I foresee my RPi being used as a controller/gateway for other devices (e.g. RPi or Arduino). In that capacity, I want the RPi to provide status via email, SMS, web updates, and so why not speech? Therefore, I'm looking for a good text-to-speech tool that will work nicely with my RPi. The two dominate free speech synthesis tools for Linux are eSpeak and Festival (which has a light-weight version called Flite). Both tools appear very popular, well supported, and produce quality voices. I sensed that Festival is more feature reach and configurable, so I went with it. 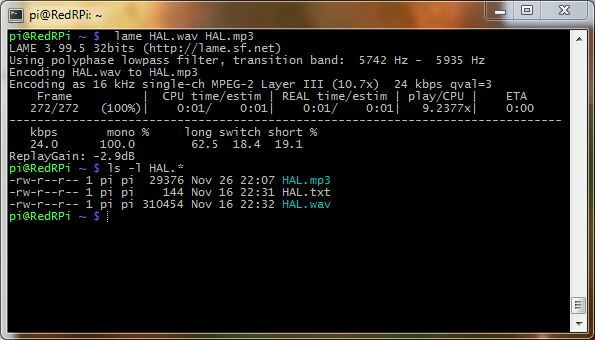 MP3 files can be 5 to 10 times smaller than WAV files, so it might be nice to convert a WAV file to MP3. You can do this via a tool called lame. Flite (festival-lite) is a small, fast run-time synthesis engine developed using Festival for small embedded machines. Taking a famous quote from HAL, the computer in the movie "2001: A Space Odyssey"
flite "Look Dave, I can see you're really upset about this. I honestly think you ought to sit down calmly, take a stress pill, and think things over." flite -voice kal "I'm now speaking kal's voice. By the way, please call me Dr. Hawking." In my case, the default voice appears to be "kal", which sounds somewhat like Stephen Hawking. "slt" appears to be a female version of the "kal" voice. flite_time is a talking clock that can speak things like "The time is now, exactly two, in the afternoon." mplayer -ao alsa -really-quiet -noconsolecontrols "http://translate.google.com/translate_tts?tl=en&q=Look Dave, I can see you're really upset about this." Some day, Google will rule the world!